The 330-foot Royal Research Ship James Clark Ross heaved in 20-foot seas southeast of Greenland. Chief Scientist Bob Pickart and I were aft on the main deck, observing our recently launched meteorological buoy and documenting its performance with video and still photographs. The buoy was held in place by a wire-and-nylon mooring connected to a 5,000-pound anchor some 3,000 meters (almost two miles) below. It appeared to be riding well, despite periodically disappearing from view behind waves more than twice its height. As we watched the sloshing waves, howling wind, and powerful currents, one of Bob’s inner thoughts leaked out: “That buoy’s never going to make it.” If our experimental mooring could survive the rough waters of the Irminger Sea, it would mark the first time that long-term ocean surface measurements had been made in this part of the world. The idea for the experiment was born a few hundred miles west, on the other side of Greenland, about seven years earlier. Bob and I had gone to sea for 47 days in the winter of 1997 aboard the WHOI-operated research vessel Knorr to take measurements in the Labrador Sea. Along the way, we planned to do a favor and recover a buoy that colleagues had set a few months earlier. When we located it, we saw that it was severely damaged, having been pounded by the frequent storms that pass through this part of the North Atlantic in winter. We never attempted the recovery because weather conditions were too rough. It was a sobering reminder of how difficult it is to place instruments at the ocean surface in high latitudes. 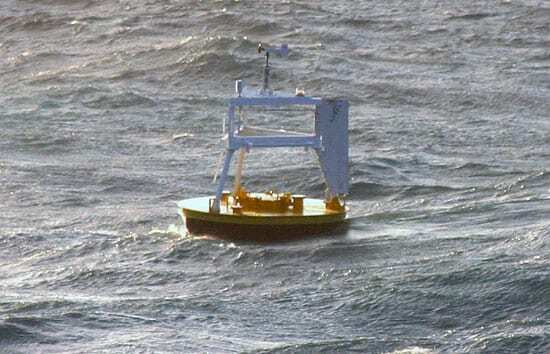 Seeing that beat-up buoy started me to thinking about attempting some measurements in high latitudes with one of our own surface buoys. Mooring technology and equipment has matured quite a bit over the years, particularly with the development of the “inverse catenary,” or slack mooring, which engineers and researchers in the WHOI Upper Ocean Processes Group have been using since 1991. The bottom part of a slack mooring, made of buoyant polypropylene, is spliced to heavier nylon ropes above it. This makes the bottom of the mooring take on an “S” shape—a bit of slack that absorbs the cyclic loading on the mooring from components, as the surface buoy heaves in the waves. (Our previous surface moorings had all been taut.) This buoyancy also assures that the lower part of the mooring will not drag on the ocean bottom when the mooring is slack. By 2004, we had many years of experience with this inverse catenary technique and just one failure. So when Bob asked me if I thought we could deploy a mooring in the Irminger Sea for the winter, I felt the odds of survival were better than even. It was worth a try. Usually oceanographic data are so precious that any equipment failure is catastrophic. But in this case, our goal was simply to see if a surface buoy could survive the winter in these rugged, high-latitude seas. Deploying the Irminger Sea buoy was the experiment. Of course, we outfitted it with meteorological sensors to measure winds, air temperatures, and relative humidity—to grab a one-of-a-kind data set, if we could. 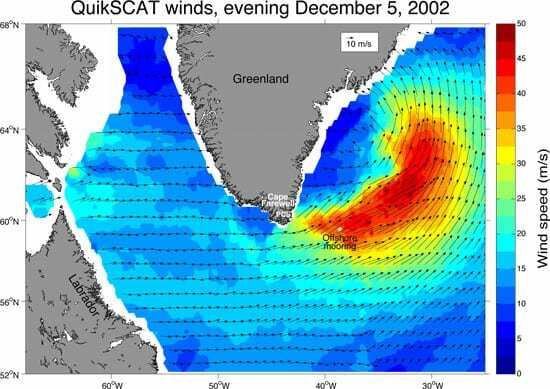 We set our buoy on July 24, 2004, and within two days we were lucky enough to experience the kind of storm the buoy was designed to measure. As we bobbed on the deck of the Ross, we witnessed a phenomenon known as an atmospheric “tip jet” event. 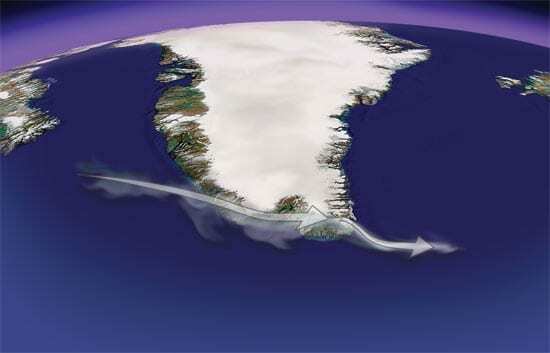 The Greenland tip jet is a sporadic, low-level atmospheric jet stream characterized by fierce winds on the lee side of Cape Farewell on the southern tip of Greenland. As storms pass through from the southwest, high-level winds descend the glacial slopes on the eastern side of Greenland, accelerating as they drop down over the ocean. In the process, they draw cold air into a relatively small area over the southern Irminger Sea. This phenomenon appears to play a critical role in chilling North Atlantic waters so that they sink to great depths and drive part of the global ocean circulation and climate system. Our buoy was perfectly positioned to measure this important, hard-to-document phenomenon. Unfortunately, the buoy broke loose from its mooring on Dec. 7, 2004, four and a half months after deployment. It was equipped with an Argos satellite transmitter, so we were able to track it as it drifted for several months. Eventually, a colleague, Hedinn Valdimarsson of the Iceland Marine Research Institute, was able to work with the Icelandic Coast Guard Cutter Odinn to recover our buoy in May 2005. 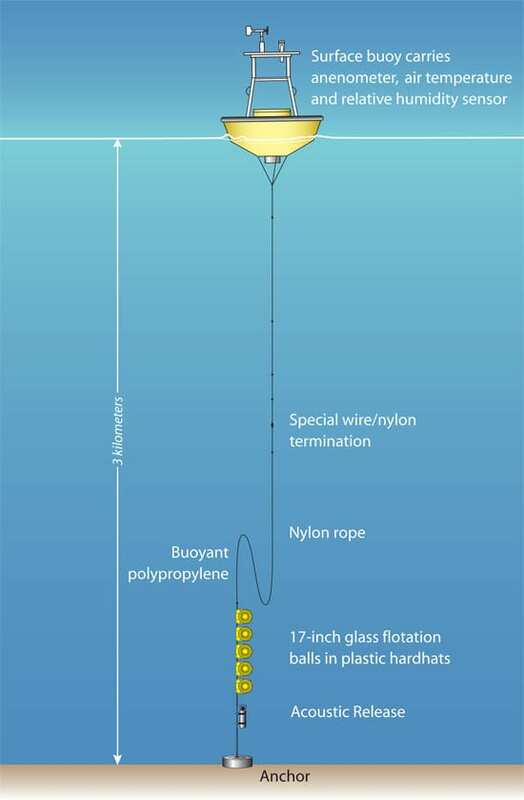 The remaining pieces revealed that a section of nylon rope had snapped or had been cut about 1,400 meters below the buoy. Why it failed has been difficult to understand, as the mooring components were the same size and strength as the many other successful surface moorings that the WHOI mooring and rigging shops have deployed in recent years. Some evidence of chafing on the line’s lower portion suggests that fishing equipment may have cut it. Although the buoy didn’t last the winter, there was a silver lining. 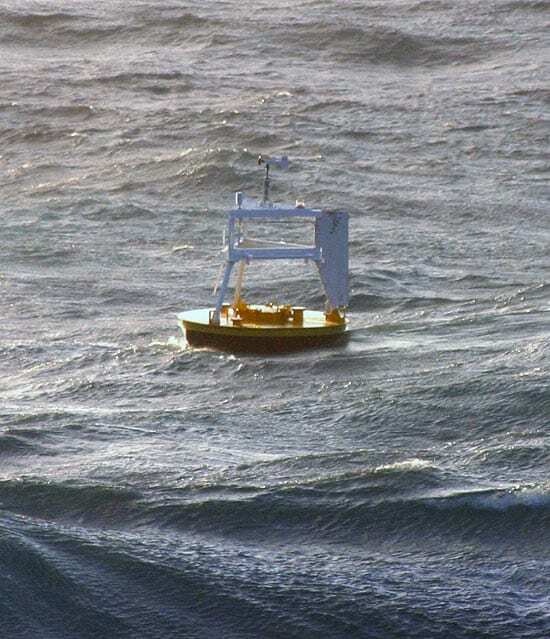 Just before the wire parted, the instruments atop the buoy measured an early-winter tip jet. That little bit of data shed some valuable insight on these events and their impact on the ocean, but we desperately need a full winter’s worth of measurements to really understand this important phenomenon. The author greatly appreciates many people who freely contributed to make this experiment happen, including: Rick Trask, head of the WHOI rigging shop; Jeff Lord, Paul Bouchard, and Jason Smith of the Upper Oceans Processes Group; and Bob Weller, chair of the Physical Oceanography Department, who donated a 3-meter discus buoy.